I think it's a great contraption for kids. Simple, repetitive action and a beautiful product at the end! It also alerts me to what my mum was thinking when she got me hooked on to this hobby! which has detailed photographs, which might help. Also, the altitude problem is quite real in the Front Range. I was in Ft Collins for two years and had similar problems with idlis. I remember even baking instructions were different for 4500 ft plus. 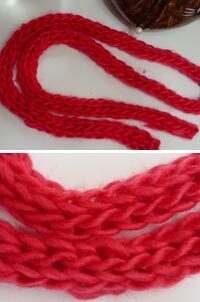 I took a closer look at your scarf and am curious: what is the pattern and yarn? It looks quite soft and cuddly. Thanks for posting this recipe. I am very happy to know my Kolambo is getting a lot of popularity. BTW..I love knitting. But I donno much about it. I just started learning it by reading some books. Donno for how long it will go on, bcos once I start working again(as a s/w engineer) I will not have much time left with me for my hobbies. Lokking forward to learn some great knitting & cooking from you. Fran, that site is just what I was looking for. Thank you so much!! Once we've worked this loom and made at least a couple of things, I will move her onto knitting with two needles. Or perhaps crochet? I went first to knitting and therefore am not very good at crochet or at least that's what I like to believe. My sister, on the other hand, has crocheted scarves and ponchos flowing out of her home. She used to do 'tatting' and made all these beautiful doilies - I just never had the patience for that. The scarf is quite painful. The yarn is baby yarn and is about 7 years old. There was no-one to knit my daughter a sweater just for her so I decided to make her one. It turned out to be quite beautiful and I still have it. It's in some suitcase somewhere and I have to dig it out. About 4 years ago, my daughter wanted a scarf that I made because some kid at day-care showed off a scarf that her mother or grandmother had knitted. I wanted to make my own pattern and came up with what is now the bane of my life. And I've also found out that it is not unique nor original. Oh well! It grows when we drive across the country or we visit India (my last visit was in 2003). Shilpa, thank you and your aayi for the recipe!! Knitting is very easy to take up. 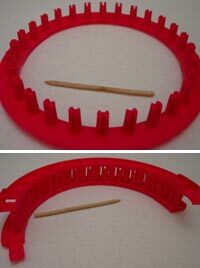 If you have a Wal*Mart near you, walk down to the Crafts department and look for starter kits. Consider the activity kits for kids, as well. These are generally more expensive but they get you started. If you are still studying then this might be the perfect thing to take to a class where you don't need to make extensive notes. I attended a lecture at Naropa University on Cognitive Development a couple of weeks ago - oh ! how I long to get back into that mode, but I digress! - and there were more than a couple of students whose hands were busy with knitting needles. And this was in an undergraduate class. If I had tried this during my undergrad days at St. Xavier's College in Bombay or my management school, I would have been dead meat. Knitting is also a neat thing to do if you commute by train or bus every day or on the days when it's not your turn to drive to work. You can listen to music or a book as you knit, too. I prefer the silence though cos there is cacophony in our house all through the day! Think about it as it is a very relaxing activity with real rewards that you can touch and feel and see! Think about it! You can do it! 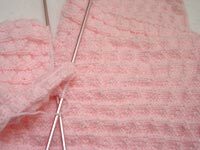 Check out fran's blog and it will lead you to some of the most wonderful knitting web sites there are! Good luck!! wow the pink scarf looks really pretty, i had learnt embroidery and crochet in fashion designing classes , but always wanted to learn knitting.Sigh! And the sambar looks yummy, thanx for sharing the recipe. You had mentioned "ripped packaging" as a reason for not knowing how to complete the knitting project; due to lack of instructions. So I was wondering, couldn't you go to the same store (if it is Walmart) and read and/or write down the instructions from another box of the same product? Priya, kolmbo is a really nice change from the regular sambar I make. Normally I take a shortcut and use MTR's sambar powder. I really enjoyed making my own sambar masala for the kolmbo. My daughter ate so much of the kolmbo that I was really surprised! I don't cook very much with coconut, mainly because of the high cholesterol it contains; at most, I will make a couple of chutneys to go with idlis and that, too, not every time I make idlis. LOL @ Abhi. Yes, it occured to me that we could do that but it meant taking time off work which unfortunately I did not have the luxury to do. My work schedule is usually flexible but not on that particular Friday. Besides, a trip to a hobby or crafts store when she is grounded is like taking her to the park - she can spend hours and hours in the Crafts section! Hey Saffron Hut! Glad you found your way here! I just visited your beautiful blog and saw that we have much in common, Ms. Freezer Queen! ;-) There was a comment on your blog that the person disliked freezing cos it means eating the same thing over many meals. Well, not true, I say! Every time I cook, I freeze at least 2 containers of the dish. After a week or two, I can look into my freezer and actually give my family various options for the next meal. I don't feel pressured when I hear: "I don't feel like eating fish today" or "I want mutter paneer" or "Mumma, remember that delicious lamb? When will you make it again?" And if eating the same thing within a week or two week is too soon, then a cooking co-op might be the answer. You cook the same amount but get the variety from the other cooks in the co-op. It also helps foster a sense of community and develops a support system for all the families involved, especially when we are all so far away from our own families. Sulochana, I stand corrected! I should have said saturated fat not cholesterol. Our bodies make the cholesterol. However, most of the fat in coconut meat is saturated fat. I don't cook with coconut oil because personally I don't like the flavor. 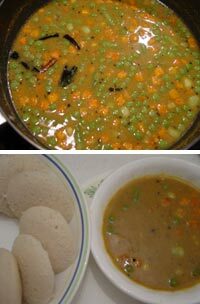 Are the idlis coming out better this year? If not, did you check out if the rice used is the right variety - because the rice used for idlis has a different consistency than that used for pulao and the like. My mother makes idlies in Montana (brrr! and 1 mile above sea level)by fermenting in the oven with the warm heat setting.. Perhaps that will help? The Visitor and YogaMango, thanks a lot for your suggestions! 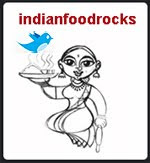 I have since fiddled with the urad:idli rava proportions and that has worked like a charm. In winter, I warm the oven and ferment the batter in the oven but by itself, that did not work. The absolute lack of humidity was the problem. Soft spongy idlis are now the norm again! Yay!